Roger Overell, Managing Director of Lightwave Yachts, is interviewed about the latest Lightwave 45 Grande’, Blue Shift, completed and launched late 2017. 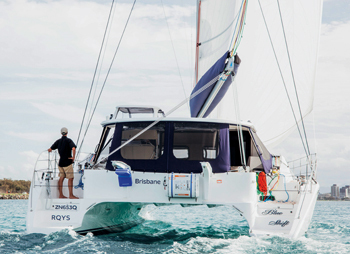 The latest catamaran from Australia’s Lightwave Yachts is not only a show-stopping world cruiser but boasts affordable customisation. 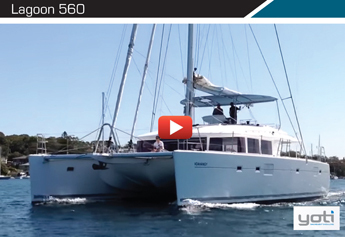 Lightwave Yachts managing director Roger Overell, informs the Lightwave 45 Grande’ Blue Shift, is the 81st Lightwave catamaran built by the company, which for the past 22 years has gained a proven production cruising catamaran record. “Along with our Lightwave owners, we are proud to remain as an Australian made product. 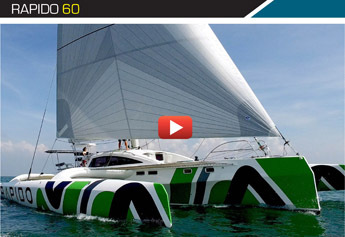 Our company has been manufacturing Lightwave catamarans on the Gold Coast since 1996. 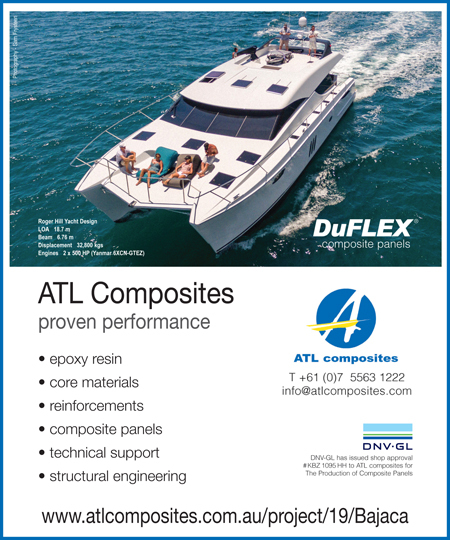 We have built our business on crafting a quality boat with proven design, for each and every one of our owners,” he says. 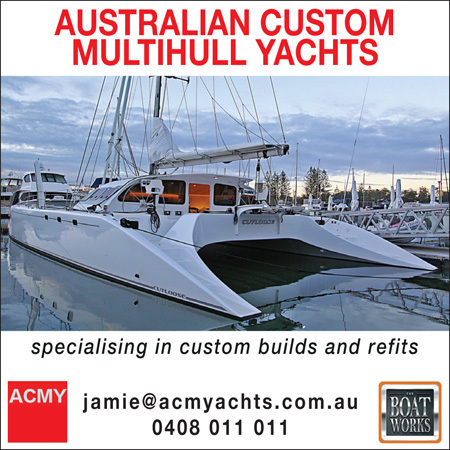 “We are a small team of builders that are skilled in each step of the construction process and are able to incorporate almost any idea that a customer may want within the boat. Often ideas from previously built Lightwaves are re-visited and refined. Each Lightwave reflects the individuality of the customer we build for’’. Great bridgedeck clearance of 0.9m. 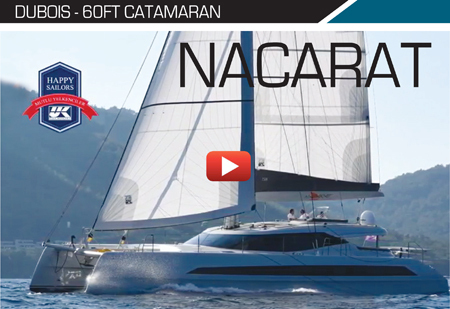 “Blue Shift is another custom-made Lightwave which is a great addition to our fleet of customized catamarans,’’ he says. 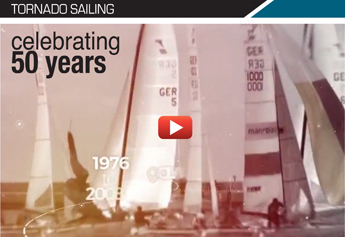 “The owners conceived the idea of owing a Lightwave 45 over 10 years ago. 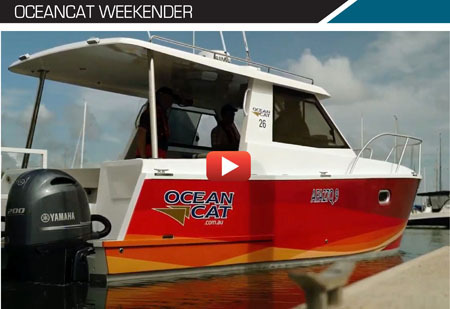 They spent time researching and chartering catamarans all over the World to contemplate what would work for them as a long-term live aboard, blue water cruising catamaran. They had a lot of input into the design layout, with each area carefully considered”. Roger asserts the Lightwave 45 Grande’ delivers remarkable roominess and comfort as well a sleek and high-performance design. 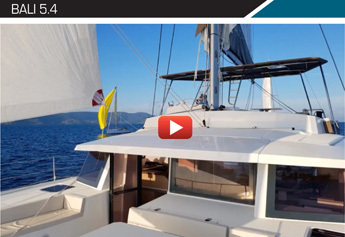 He says that as well as being a single-hander cruiser, the Lightwave 45 Grande’ design is also adaptable for a commercial application for charter sailing, with the option of a four cabin, four bathroom layout. 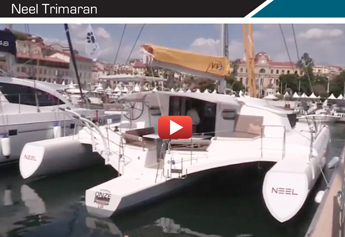 Roger explains that Lightwave catamarans provide the ultimate in lifestyle design as well as prime cruising systems with their personally crafted interior designs and moulded finishes on sleek fibreglass hulls. 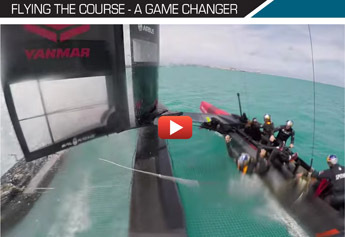 Roger promotes that functional and adaptable sailing features are a priority. 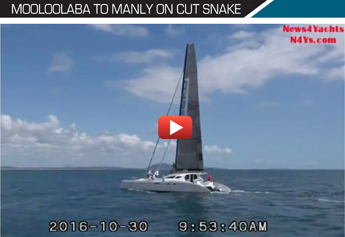 “When it comes to sailing we’ve incorporated the great features you can get these days including square top main sails,’’ he says. 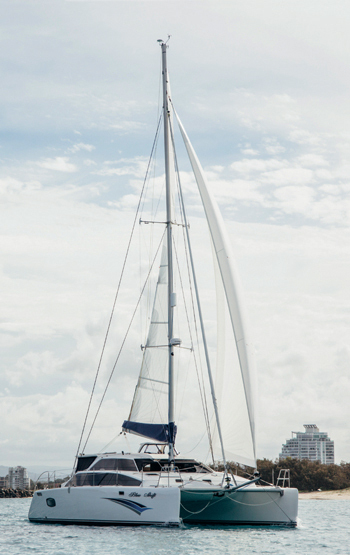 “We have used unique reaching and reefing systems for ease of handling, and improved performance. 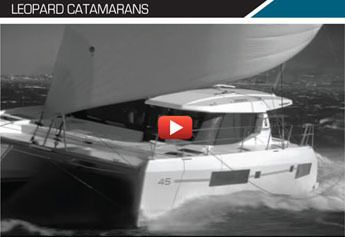 He says the sailing systems on the Lightwave 45 Grande’ are vast, and are tailored to the customers’ experience. 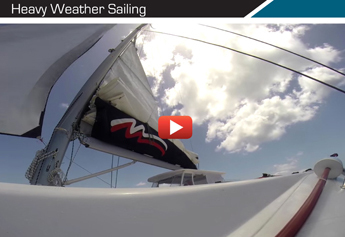 He explains that the boat can be adapted to run the genoa, self-tacking headsails, spinnakers and/or screecher, whatever the customer is looking for. 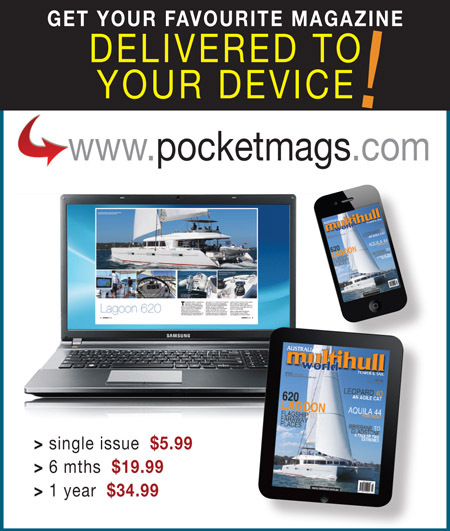 “We run a bridle mainsheet system and because we are triangulating the boom this gives a lot of benefits. It does away with the traveller on top of the transom which causes safety concerns and helps reduce the impact from jibing loads. It stabilises the boom to stop the bouncing action and the swinging from side to side that the traveller system can suffer from. 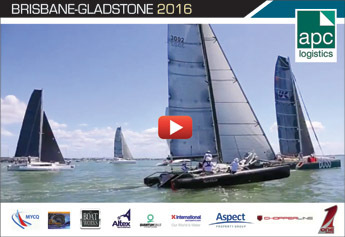 The bridle system still gives you the full range of sail settings that you can achieve from a conventional main sheet system”. Roger explains the customised boat’s navigation system on Blue Shift features an innovative design enabling the skipper to steer from the saloon area as well as the helm. 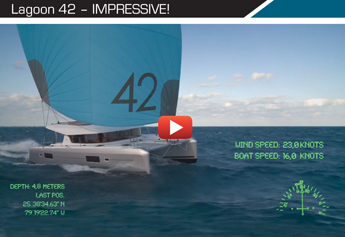 “We have incorporated an interior forward positioned navigation station with its own fully integrated, chart-plotter screen, which is quite unique to the yacht. This was a personal requirement as specified by the owners. The navigation station features duplication of instruments at the helm. Raised helm station, clear of cockpit yet safely positioned to maintain communication with crew. 140L fridge/freezer under helm. 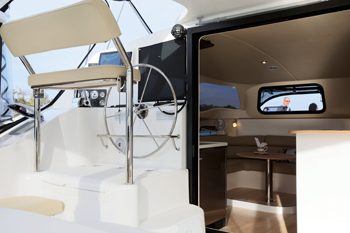 Premium quality Strata Glass is used to enclose the helm position to provide protection in all weather conditions. 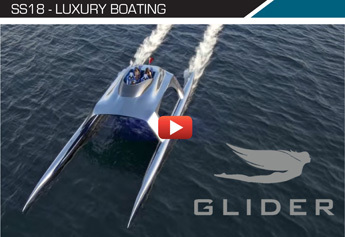 “The vision is outstanding from the raised steering position and it means your helm can become your really comfortable long-term viewing platform,” he says. Roger informs that the forward deck incorporates a separate locker for 75m of anchor chain and two additional lockers for sail storage, fenders, inflatable kayaks or any other storage required. Quality Ferrari PVC is used for the trampolines on the forward deck to ensure longevity and toughness. This Lightwave 45 Grande is powered by two Volvo Penta 55hp diesel engines, housed in the large external engine rooms, efficiently powering the yacht to a cruising speed of 8kts, and a top speed of 9.5kts. Blue Shift sleeps six people in the three cabins with large and comfortable bedding and boasting queen-size beds in all the cabins. “When you go down to the port hull, you have an entire hull that is your master cabin where there is an end access queen size bed forward, and an aft plush size bathroom with a washing machine and dryer,” Roger says. “There is also the option of the aft cabin in the owners’ hull configuration, featuring lower queen bed access, only 600mm of the sole, with the bathroom and laundry forward,” he explains. The starboard hull features a Guest cabin with full ensuite. The aft cabin can covert from two singles to a queen. Roger details that there is a flow on space mid-ships with additional cupboard space to compliment the galley pantry area and a microwave discreetly positioned by owners choice for the rare time they might use it. Outboard side is a desk area with free standing seat and a customised built in computer monitor arm. 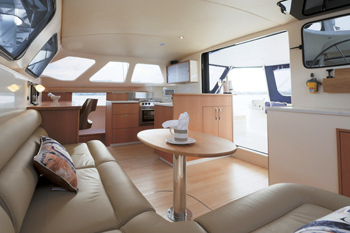 Roger remarks that the saloon features plenty of affordable luxury with this Lightwave 45 Grande’, boasting a specialised coffee-making station, a bar area with fridge, a forward facing navigation station, and a coffee table with comfortable lounge seating, in a galley up configuration. 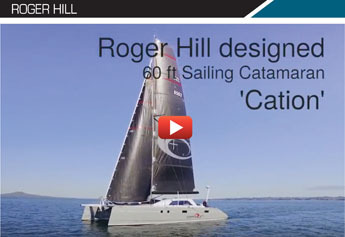 Roger clarifies that the standard arrangement for the galley is in the starboard hull. Saloon area incorporates galley up, coffee making station, bar area, entertainment unit, forward facing nav station and coffee table with comfortable lounge. To open up the cockpit area further, Roger reveals the owners requested to alter the placement of the supporting arms for the cockpit roof on Blue Shift, to the transom. “This creates an unobstructed area and view looking back over the water from the large alfresco dining area,” he explains. “The cockpit can be fully enclosed and weather protected, or opened up with the rolling clears and covers. It is an expansive outdoor area which flows to the saloon area, providing ample living and entertaining areas’’. Blue Shift has all the latest cruising gear on board. It has a 210L per hour water maker on board, twin 16,000 BTU air conditioners, a five KVA genset, a dive tank compressor land bottles, and great fuel and water capacity (800L of each), Roger details. “There is a bank of eight solar panels which generates nearly 1000 watts of power. This is also complemented by a lithium battery bank. 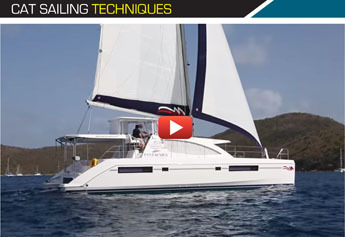 A lot of time and engineering has been dedicated to the electrical system on the Lightwave catamarans. It takes into account the customer’s expectations and particular use, to produce a sophisticated, dependable and user friendly system. As with all the systems on the boat, it is easy to access. In the cruising application, this ease of access is critical”. Roger further details that there is a comprehensive list of safety items based on the owners ocean cruising requirements which includes a life raft.